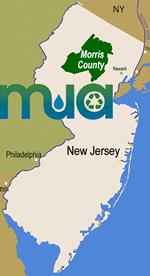 The Morris County Board of Chosen Freeholders has designated the MCMUA to be the implementng agency for the Morris County Solid Waste Management Plan. As such, the MCMUA provides operations such as solid waste disposal at its transfer stations to the hauling community, curbside recycling collection to municipalities, and additional solid waste management services to the residents and businesses of Morris County. At home we recycle, create waste and need a little help. At work we also recycle and create waste. Using MCMUA transfer stations and other facilities. Materials List - Recyclables, etc.